Synopsis: Months after helping Tony Stark (Downey, Jr.) during the events of Captain America: Civil War, Peter Parker (Holland) is doing his best to balance his dual-life being a high school student and Spider-Man. In the process of trying to impress Stark in hopes of joining The Avengers full-time, Peter stumbles upon a gang - lead by Adrian Toomes (Keaton) - that's selling black-market weapons powered by Chitauri technology, and decides to take things into his own hands. Andrew: Hello dear readers! In what may be a bit of surprise it turns out Two Tickets For... is not dead, it's just been dormant. We've been absolutely terrible at reviewing the movies we've been seeing and we'll try our best to get back to reviewing on at least a semi-regular basis. That's our goal, especially since 2017 is turning out to be a pretty good year for movies! For now though we're back because we were fortunate enough to see an early screening of one of this summer's more highly-anticipated blockbusters - Marvel and Sony's Spider-Man: Homecoming! Sarah: Yes we did! Spider-Man: Homecoming is the sixth and newest installment in Sony's on-going attempts to bring Spider-Man to the silver screen, but unlike Sam Raimi's Spider-Man trilogy with Tobey Maguire or the two Amazing Spider-Man films starring Andrew Garfield, Spider-Man: Homecoming was produced by Marvel Studios! A: Yes! Marvel worked out a deal with Sony where Marvel would actually control the creative process and make the film while Sony got to keep marketing and distribution rights. In the process Marvel gets to use Spider-Man in other Marvel Studios films and Sony gets to have some other Marvel characters appear in their Spider-Man films. A fair deal, if you ask me. S: Maybe not necessarily a younger version, because he's still in high school in the other movies, but Holland himself is younger. A: Right, Holland was only 20 when they filmed Spider-Man: Homecoming as opposed to Maguire being 26 and Garfield being 28 when they first portrayed Peter Parker/Spider-Man, respectively. Though this film does state at one point that Peter is only 15 years old as opposed to being a high school senior like Maguire's version was at the beginning of 2002's Spider-Man. A: Anyhow, this is a film I know I've been looking forward to because it was a Marvel production instead of a Sony one. Sarah, now that we've seen Spider-Man: Homecoming what did you think of it and how did you feel it fit into the MCU? S: Oh I thoroughly enjoyed it. I thought it was a lot of fun and a seamless injection of the Spider-Man character into the Marvel Cinematic Universe that we've come to know and love. It was a lot of fun. It was reminiscent of the first Iron Man movie with a little bit of Guardians of the Galaxy thrown in there, meaning that overall fun vibe, but it definitely had that Iron Man feel with Peter learning how to use the technology Tony Stark has given him. I really enjoyed it! It was a lot of fun to watch and I really can't wait to see it again! A: From my perspective the operative word is one you just said a number of times and that's "fun." Fun is the very first word I think of when I think about Spider-Man: Homecoming. It was so much fun to watch, Holland is clearly having a blast playing Peter Parker, and Peter Parker is having a blast being Spider-Man/trying to become a member of the Avengers. And I really dug that they kept Peter in high school. He is a high school student through and through, and really, this is a high school movie. I know the director, Jon Watts (Cop Car), had the cast and crew watch a lot of John Hughes movies as well as some other 1980's staples like Can't Hardly Wait, and you get that feel when you watch this film. Because with the exception of a few adults in the film - like Tony, Happy, Michael Keaton's villain and Marisa Tomei's Aunt May - it's all kids driving this film. S: I would definitely agree that it had a Hughes-esque feel to it, like a teen buddy comedy with that classic teen/high school angst thrown in for good measure. 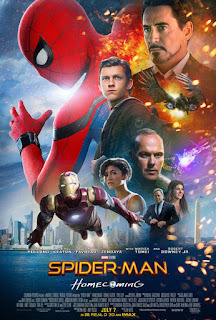 The cast was really strong across the board, like Jacob Batalon as Ned, Peter's best friend, being a great source of comedy; Laura Harrier playing Liz, the senior girl and leader of Peter's debate team, the classic high school crush; and former Disney Channel star Zendaya as Michelle, the weird, outsider-y girl who loves to make jokes at Peter's expense. A: I was also a fan of the different portrayal of Flash, Peter's bully who's typically portrayed as a big, muscular jock but is instead played here by Tony Revolori (who was great in The Grand Budapest Hotel) as another member of the debate team and a douchey EDM DJ wannabe. S: Me too! I just really appreciated that they were able to incorporate all these teenage characters into an MCU film, because up until now all of the characters are adults, and this kind of pulls it back to being about your local superhero - or your friendly, neighborhood Spider-Man. So I thought that was a nice aspect and really well done. I had a lot of fun watching this movie and I can't wait to see what else they do with this character. Spider-Man is not traditionally (as I have learned) an Avenger, he's just a superhero in the Marvel universe. But he is going to show up in Avengers: Infinity War which will be great because I think Tom Holland brings another fun-loving angle to the universe and I'm excited to see him interact with Chris Pratt's Star-Lord. Also, whereas all the other MCU characters aren't really overwhelmed or awed by the whole superhero universe thing, here you've got young Peter Parker who's wide-eyed. And yeah he has superpowers but he's still all, "Oh wow! Iron Man and Captain America and Thor?!" He is a fan boy! S: 100% star-struck. And because he's such a kid, such a fan boy, it's fun to watch him get excited about this world as well. A: Right, and then that contract is taken away from him by the government, so he utilizes some of the Chitauri technology they'd already hauled away for his own purposes in becoming The Vulture. I just thought that was a phenomenal way to incorporate these elements of the Spider-Man comics into the MCU. You get to see how other people are affected by the events of The Avengers and living in a world where these heroes and demigods live. S: And to show that these superheros aren't necessarily heroes to everyone. We've seen that already a little bit in some of the other movies like Avengers: Age of Ultron and Captain America: Civil War - these heroes aren't heroes to everyone and they are causing a mess in people's lives, and this film kind of picks up that thread a bit. I appreciate that they're showing both sides of all of this in the MCU. S: Well and just that Happy is back! We haven't seen him since Iron Man 3. And like you and I discussed as we were leaving the screening, it was nice to see Favreau get so much screen time because he helped launch this Marvel Cinematic Universe as the director of Iron Man and Iron Man 2. It's because of his vision for the character that we were able to get this massive universe that includes the films, merchandise and probably a theme park in the future. Favreau kind of got to have his day in the sun because of it and I'm glad Marvel and Jon Watts recognized that. A: Agreed. I mean, we all know Marvel Studios President Kevin Feige is the mastermind behind the MCU, but Jon Favreau was the steady hand that pulled the first film together and showed Feige that this potential film universe could actually work. A: Favreau got it started off on a great foot, absolutely. Before we wrap things up, one thing I wanted to touch on was the film's villain. I don't know about you, but I thought that Michael Keaton's Adrian Toomes might be the best Marvel villain since...well, maybe ever. A: Well hear me out. Most Marvel villains have been relatively one-dimensional, are defeated too easily or have some big McGuffin and it builds into some big fight for the universe - whether it's the Tesseract, the Aether or the Power Stone or whatever. Keaton's Adrian Toomes is, much like Tony tells Peter to be, street-level. He's a street-level villain, and though he had some cool technology, he's really just a dude who had things taken from him and he managed to turn it into his favor. His motivation is very simple, he's not this huge arch-nemesis. He just wants to provide for his family. S: Oh it was definitely done very well. I will say though...the problem with the other MCU villains - with the exception of Loki because he's an overarching antagonist - every other MCU villain it's like...how can they win? Because they're up against literal and figurative gods. Like how is Justin Hammer supposed to go up against Iron Man when he barely knows how to use his own technology. But here we finally have a hero who's a kid who doesn't quite have his stuff up to snuff. He's still learning his powers, he's still learning how to use this new suit he's been given by Tony, it is extremely advanced and he thinks he knows everything but he just doesn't. And he's going up against an equal if not a little more powerful villain. Whereas all the other MCU heroes are going up against villains who aren't quite as powerful as they are. A: Obadiah Stane is one thing, he's whatever. That's the thing about the Iron Man movies - they all have weak villains. The best villain in the three Iron Man films is The Mandarin and he doesn't even turn out to be an actual villain. A good villain should be an actual threat to the hero, and if they have a compelling backstory that's even better. And I thought Spider-Man: Homecoming had a good one. Michael Keaton is a big part of that. He played it really, really well. I guess that's part of my point, too. Keaton plays a great villain here and I'm glad he's continuing this late career renaissance he's been on. S: Okay, I can buy that. A: Another aspect I really liked is that this film is an origin movie without being a typical Spider-Man origin movie. S: Yeah! Because we know what happens, we know how Peter gets his powers, we've seen Uncle Ben die, we've heard "With great power comes great responsibility," we've seen it. We know it. By the way, I really like Maria Tomei's younger Aunt May. She's fun, she's more modern and she gets it. I liked that about her. She's quirky and she's hot! Like everybody in the neighborhood thinks she's hot and that's just another part of the humor of the movie. I appreciated that. A: Agreed. What I like is that Peter is already Spider-Man when this movie starts, we're kind of dropped into the middle of it and he's been Spider-Man for a little while already - we don't need to see the spider bite, we don't need to see Uncle Ben and all that. But as you mentioned earlier Peter has a new suit from Tony, he's learning how to use it, how to harness his abilities, and more crucially he's learning how to act like a hero. That's one of the overall themes of the movie - yeah he's been Spider-Man for a while already but he's still a kid and he's still learning. He's not a fully formed Spider-Man just yet, and I really dug that. A: Okay Sarah, final thoughts on Spider-Man: Homecoming? S: I thought it was a great movie. I think it's fits into the MCU perfectly. I really like how they're incorporating other Avengers into the other MCU films, because I think they've realized that that's something the audience wants. They want to see the other characters interacting with each other, they don't necessarily want to see just pure standalone movies anymore. I really liked Tom Holland's Peter Parker. I think that he has that wholesome, Americana feel to him, which is funny because Holland is British. A: Another Brit gets to play an American hero! S: But it's still fun and you can tell he's having a lot of fun which really comes through in the movie. So I'm giving this movie a 5 out of 5. A: Nice! I think this is the best Spider-Man movie that's been made yet. Spider-Man 2 is still great but for different reasons. I just think Spider-Man: Homecoming really taps into who Peter Parker is, he's still a kid, I loved the villain, and this film worked so well in the MCU. I know it's one we're going to go see again in theatres. And honestly? I think this might be the best Marvel movie since....Guardians of the Galaxy? A: Don't get me wrong, I really loved Guardians of the Galaxy Vol. 2, but with how well they nailed Peter, how good a villain I thought Keaton's Vulture was, and how well it fit into the MCU, I'm putting this one up there. How about you? S: I would put it at the same level as Guardians of the Galaxy 2, because that movie was also a lot of fun. A: I think we can at least agree that Marvel continues to make "fun" movies, and we're grateful for that. S: Agreed. Oh! And heads up: there are two credit scenes - one in the middle and one at the very end! A: And the one at the very end may very well be my favorite they've ever done. FINAL VERDICT: Go see it in theatres! You need to write a column for a magazine or newspaper or something where you get paid. This was amazing to read, and it convinced me to see this fun flick that I previously thought that I was going to skip.